We're offered an advanced look at the 'Cardinal' Air Jordan Retro 7 on-foot before their release later this month. Looking to close out the month of June with a bang, the Jordan Brand is set to release the 'Cardinal' Air Jordan Retro 7 for the first time in five years. Coming as the second original colorway of the Air Jordan VII to make a return this year, we are treated to an advanced look at the Cardinal's on foot. They appear almost identical to the 2006 retro release, with the exception of the silver lacetips replacing the gold used in '06. 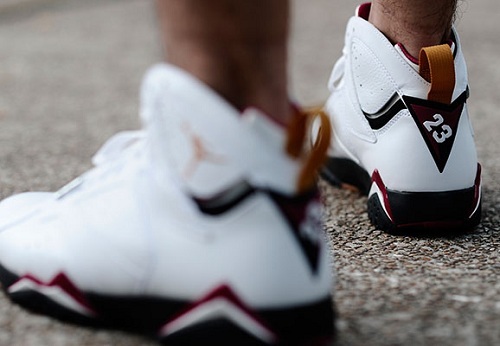 We also see a slightly shorter tongue on the 2011 Cardinal's, something many collectors were quick to point out on the recently released 'Bordeaux' Air Jordan Retro 7. 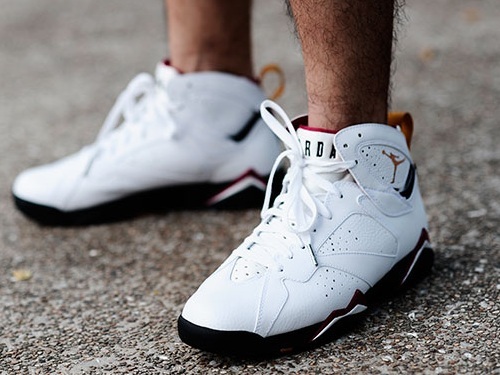 Either way, still an impressive re-release of the classic Air Jordan VII. Enjoy an on-foot look at the Cardinals below and look for them to release June 18th at select Jordan Brand retailers.